A team of American researchers have created a portable, miniature microscope in the hope of reducing the time taken to diagnose oral cancer. Credit: Dr. John X.J. Zhang, Department of Biomedical Engineering, the University of Texas at Austin. A team of American researchers have created a portable, miniature microscope in the hope of reducing the time taken to diagnose oral cancer. 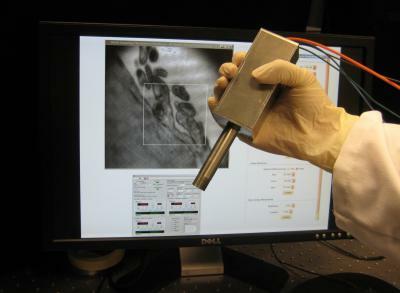 The probe, which is around 20 cm long and 1 cm wide at its tip, could be used by doctors to diagnose oral cancer in real-time or as a surgical guidance tool; dentists could also use it to screen for early-stage cancer cells. The probe has been presented today in IOP Publishing's Journal of Micromechanics and Microengineering, and has shown good agreement with images of oral cancers obtained using conventional, much slower techniques at the University of Texas Health Science Centre at San Antonio, TX. Historically, the death rate associated with oral cancer is particularly high; not because it is hard to discover or diagnose, but due to the cancer being routinely discovered late in its development. Lead author of the study Dr John X J Zhang at the University of Texas at Austin said: "Today, that statement is still true, as there isn't a comprehensive programme in the US to opportunistically screen for the disease; without that, late stage discovery is more common." The probe uses a laser to illuminate areas of the sample and can view beneath the surface of tissue, creating full 3D images. It can also take a series of images and layer them on top of each other, much like the tiling of a mosaic, giving a large overall field-of-view. The key component of the probe is a micromirror. Micromirrors have previously been used in barcode scanners and fibre optic switches and are controlled by a microelectromechanical system, allowing the laser beam to scan an area in a programmed fashion. The low cost and ease of fabrication of micromirrors, along with their easy integration into electronic systems for versatile imaging operations, make them an indispensable component of the probe. Oral cancers have traditionally been diagnosed by biopsy. Based on a doctor's visual inspection, medical practitioners remove a sample of tissue from the patient and send it off to a pathologist who will examine the tissue under a microscope to check for abnormal or malignant cells. Results will be sent back to the doctor for the next round of diagnoses or surgery; the whole process can take up to several weeks. Not only is this process time consuming, it can be costly, invasive and painful, often leaving scars. "Due to the lack of real-time efficient oral cancer screening tools, it is estimated that approximately $3.2 billion is spent in the United States each year on treatment of such cancers", Dr Zhang continued. The researchers, from the University of Texas at Austin and the commercialization partner NanoLite Systems, Inc. are now planning clinical trials with a view to gaining approval from the Food and Drug Administration (FDA). They envisage that, with a few adjustments, the device could be built for a quarter of the price it costs to build the microscopes that are currently used in diagnosis, which is around $300 000.